I was out in the country yesterday. That's why there is a double post for today. I went to visit my friend Lisa who lives in Augusta County in the George Washington National Forest. She and her husband, Mark, have a little place on 4 acres, slightly in the middle of nowhere. They do have neighbors close by and a country store, so it's not all that in the middle of nowhere. But it does take about 30 minutes or so to get into Staunton. Out where Lisa is, there is no wireless cell service and they don't have an internet connection. They don't even have cable tv. Internet and cable are available but they just aren't priorities for Lisa and Mark. They get by just fine without either. I wish I could do that. Without any internet I was disconnected and I liked it. It was nice to be disconnected and difficult to want to reconnect today. It seriously felt like a rest for my brain. 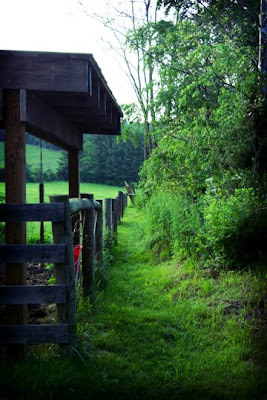 The photo is the path that runs past their barn back to their apple tree and little orchard that they are just getting going. It's quiet and peaceful there. Even though I was there just under 24 hours, I do feel little renewed and restored.